The heart has four chambers. The two upper chambers are called the left and right atria, and the two lower are called the left and right ventricles. 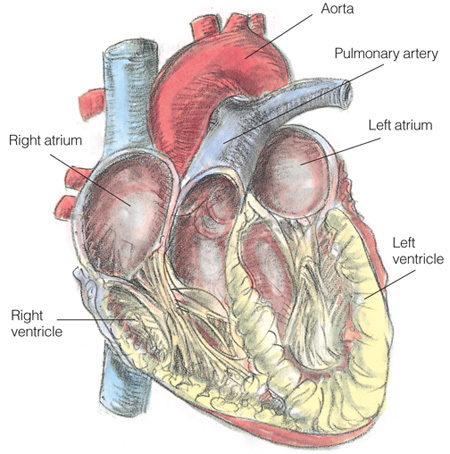 The left atrium is connected to the left ventricle with a valve, and the right atrium is connected to the right ventricle with a valve. Together, the four chambers circulate oxygen-depleted blood to the lungs through the pulmonary artery and oxygen-rich blood to the rest of the body through the aorta. In heart failure, one or both of the ventricles loses pumping power, resulting in reduced blood circulation and fluid buildup in the body’s tissues.